Drinkable, usable water is one of our most precious commodities. Yet in some corners of the world, it’s fast becoming one of our scarcest, including right here in the U.S. The good news: there are trillions of gallons of brackish ground water here. But brackish ground water is only usable after it’s been purified by the costly process of current purification methods. 844 million people live without access to safe water, and 2.3 billion live without access to improved sanitation. According to Water.org, 1 in 9 people lack access to safe water; 1 in 3 people lack access to a toilet. More people have a mobile phone than a toilet. Brackish water, or briny water, has more salinity than fresh water, but not as much as seawater. It cannot be consumed or used in agriculture. Brackish water may result when seawater mixes with fresh water, as in estuaries, or it may be found in inland brackish aquifers. Since many of the world’s inland aquifers are brackish water aquifers, there is a shortage of clean, fresh water in many communities around the world. KNeW can produce economically viable clean, fresh water for personal, industrial, and agricultural needs while simultaneously generating additional revenue from its primary products – fertilizers and plant nutrients. KNeW water treatment plants can scale as communities grow, with expansion potential designed into the first facility. Its products, including high value fertilizer, can also form a basis for new business opportunities in local agriculture and food supply. Fertilizer and product marketing is managed by KNeW as part of its contracts with communities, and the company bears the fertilizer marketing and pricing risk. 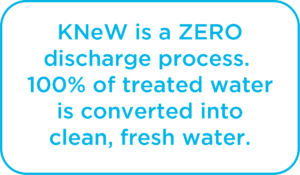 KNeW’s technology is a patented, environmentally responsible industrial process that converts brackish water and acid mine drainage into clean water. Using our proprietary technology based on scientifically proven ion exchange processes, we restructure the ions in brackish water to extract potassium nitrate and other valuable fertilizers and plant nutrients, while producing clean, fresh water. KNeW allows for greater energy supply choices (solar, wind, hydro, natural gas). KNeW is a ZERO waste process. The KNeW process is a zero-discharge treatment process. Nearly 100% of the treated water is converted into clean, fresh water. Evaporation accounts for approximately 2% of the total water. It’s true that sea water and brackish water near a coastline may be less costly to convert to pure water using current desalination processes, because the brine from that water can be returned to the sea. However, this process is extremely costly and harmful to the environment in locations that are further inland. Instead of going back to the sea, the brine needs to be disposed of and treated. Current desalination processes have adverse effects on ground water composition and water tables. The KNeW Process changes all that. It’s a patented method involving ion exchange. The KNeW process recovers water and converts the brine to potassium nitrate and ammonium sulfate fertilizers. The sale of these fertilizers allows the KNeW process to sell water at competitive rates and offset treatment costs. 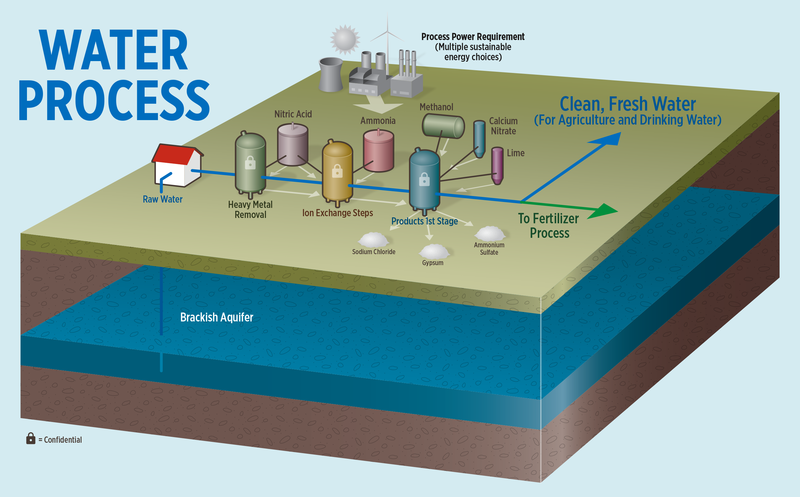 Brackish water from rivers or underground aquifers is filtered to remove coarse particles. The water is pumped through an ion exchange battery to remove all the dissolved ions. The process removes the substance most damaging to the earth’s crust—sodium. Residual nitrates are recycled or treated to create useful products for agricultural, chemical and other industries. Why Is Michael Burry Investing In Water? For technical information information, please contact us.